super easy soup that you make from ingredients that you probably already have on hand. This is a pantry soup because it uses things you probably already have in your pantry or fridge. We get so little rain in California these days, that when rain finally comes, it’s nice to be able to create a soup without having to go shopping! In a big pot over medium heat, saute the onion, celery and carrotsin the olive oil until softened. Add the Herbs d’Provence and stir for about 1 minute, until fragrant. Add the wine and let the wine reduce by halfish. Add the broth, the cream of chicken soup and the chicken or turkey and simmer for 10 minutes. Add the greens and let simmer for 5 more minutes (until greens are tender). Add salt and pepper to taste. Put 2 T of rice, grains or pasta in the bottom of each of 2 pretty bowls. Ladel the soup on top. Top with a float of Greek Yogurt or Sour Cream and a sprinkle of scallions. 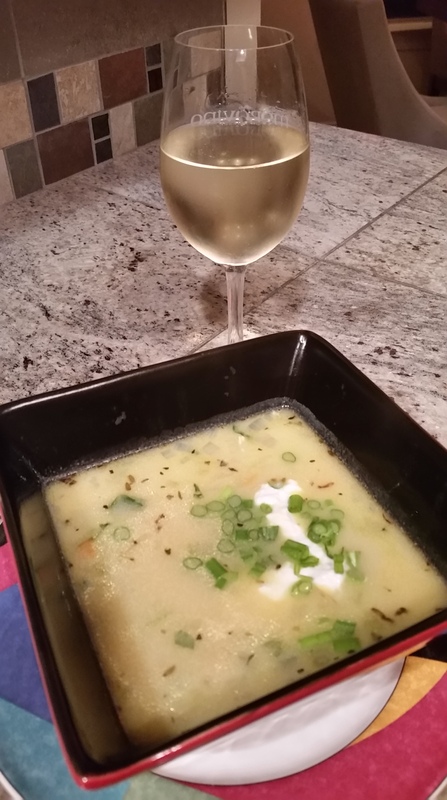 Tastes just like Chicken Pot Pie – in a soup!! So easy. So comforting!! Put all ingredients in blender. Whirl. Put on salad! (Mrs. Vino’s Note: I tried using less salt, but the result just wasn’t as good so I suggest using the full amount. And, depending on the size of your Avocado, this dressing can get pretty thick. Try thinning it down with a little extra balsamic or water if you need to – it’s still delicious). Have a favorite recipe?? I’d love to share it. At the recent wine club party, Mrs. Vino debuted a “hummus” made with Edamame. It’s one of my FAVE super easy, super healthy appetizers. It’s a beautiful fluffy dip for veggies or rice cracker. It’s also pretty good tossed with Asian noodles as a cold salad. This dish is absolutely wonderful with Morovino’s new Dry Riesling. There were numerous requests for the recipe, so here you go! Mr. Vino is not a fan of very spicy dishes, so Mrs. Vino uses 1/4 t of Chili Garlic Paste. If you prefer a spicier dish, just stir in more chili paste at the very end of the dish. Disolve the Miso in warm water to create a paste. Add all the ingredients into the bowl of your food processor. Process til smooth. Add a bit more rice wine vinegar or water if you need to thin it out a bit. Put it in a pretty bowl, then top it with a drizzle of toasted sesame oil if you like. YES, it is just that easy. I recently invested in a cool new kitchen tool – a rice cooker. I’ve been making rice for decades, and I consider myself a good cook, but rice is usually hit-and-miss with me. As we eat a fair amount of rice, it seemed like a good investment. As it turns out, the rice cooker does a lot more than cook rice. In fact, I played with my rice cooker for two weeks before I actually tried to cook rice in it! One of the things that my rice cooker does REALLY WELL is Quinoa. I love Quinoa – it’s healthy, it’s got nice texture, a great nutty flavor and you can do sooooo much with it. When I cook it on the stovetop, it frequenly comes out gummy. However, in the rice cooker (use the white rice setting) it turns out fluffy and light and perfect. The only downside to making Quinoa in my rice cooker is that you need to make at least 2 cups. That is lots of Quinoa. So here’s a great recipe to use up some of your leftover cold Quinoa. This salad is healthy and delicious. 4 green onions, sliced lengthwise, then crosswise in 1/2″ pieces. Another great use for the rice cooker is steaming – one of my new fave easy meals is to make brown basmati rice in the bottom of the rice cooker while simultaneously steaming salmon filets in Teriyaki sauce in the steamer basket. Wow. More on that later. Back to this recipe – let’s steam the chicken. Put water, 1 garlic clove and 2 bay leaves in the bottom pot of your rice cooker. Then put the steamer tray in the top. Put the boneless skinless chicken breasts in the steamer tray, sprinkle them with salt and pepper and steam for 18-20 minutes (or however long your rice cooker booklet says). Prewashed spinach is one of those amazing cheats that I don’t feel at all bad about using. Toss the Spinach, Quinoa, bleu cheese, pear slices, green onions and cranberries together in a large bowl. Whisk together the dressing ingredients. Toss the dressing with the salad greens. Put 1/2 the salad on each of 2 dinner plantes. Top each salad with one of the sliced cooked chicken breasts. Sprinkle with a bit more of the crumbled bleu cheese. Yum-o-licious. This EZ party appetizer was the hit of the Labor Day wine club party. Roasting really mellows the astringency/bitterness of olives. This makes A LOT of olives, but you will find that they all manage to disappear. Preheat your oven to 375 degrees. Pour the big jar of olives and the 2 C of Kalamata olives into a strainer to drain, pat them dry with paper towels. Put them into a large baking dish or roasting pan. You want them in a single layer if possible. Sprinkle the chopped rosemary on top of the olives. Use your microplane grater to grate the lemon peel over the olives (don’t have a microplane grater – YIKES they are the best kitchen tool ever!). Halve the lemons and squeeze the lemon juice over the olives. Scatter the whole garlic cloves among the olives*. Drizzle the olive oil over the top. Sprinkle the pepper. Mix it with a spoon to make sure the olives are coated with olive oil. Place the baking dish in the oven and let the olives roast for about 30 – 40 minutes (oooohhhhh, your house is going to smell good). Stir the olives a few times to make sure they cook evenly. You can tell you are there when the olives soften and wrinkle a bit and the garlic is a bit golden/brown around the edges. Roasting really tames the astringency/bitterness in the olives and makes the flavors sooooooo mellow. This makes A LOT of olives. The good news is that they will hold for a week in the fridge. Great all by themselves or make a salad plate with a couple of slices of goat cheese, a few olives and a couple of thin slices of baquette. Be aware that these things are addictive. NOTE: When I made these in the tasting room for our pick up party, I actually used an amazing product called Majestic Garlic, Raw Pickled Garlic with Cayenne instead of fresh garlic cloves. This is a great raw foods product that someone gifts us with. I think you can get it at Whole Foods or other gourmet specialty markets. If you find this, use 1/2 jar, drain them before adding to the olives and omit the black pepper. You’ve gotta love any recipe that is drain, stir, bake, stir, eat. Mrs. Vino was introduced to tomatillos last year in her Cal Poly Organic Farm Harvest Box. I’d never cooked with them before, but they quickly became one of my very favorite “bright” ingredients. Tomatillos are typically used cooked or roasted, but this fresh salsa is great on just about everything. Now you can do this two different ways. Mrs. Vino finds a certain Zen focus in chopping things. There are times when she just needs to get out her knives and chop things into very, very small bits. So, the Zen version of this recipe involves taking all the veggies and chopping them into 1/4″ dice by hand. Very soothing. Then combining the veggies with the vinegar and sugar in a non reactive bowl and refrigerating for at least one hour before serving. The instant gratification version of this involves giving all the veggies a couple of good whacks to cut them in pieces, putting them in your food processor with the sugar and rice wine vinegar and giving them a little whirl. THEN, putting the salsa in a non reactive bowl and refrigerating for at least one hour before serving. Either way, this salsa is fresh and delicious. Mrs. Vino uses it on: scrambled eggs, chicken breasts, grilled cheese sandwiches, pork tenderloin, enchiladas, chilled avocado soup . . . the list is endless. For a fabulous summer salad, try this over a “Carpaccio” of very thinly sliced summer squash drizzled with olive oil. This salsa will hold for several days covered tightly in your fridge. This recipe comes courtesy of Tia Vino (Mr. Vino’s Sister-in-Law) who is an outstanding and awesome cook. Mrs. Vino loves it when Tia and Tio Vino come to visit in early spring to escape the snow. She loves it for several reasons. 1. Frequently, she comes home from work to find dinner almost ready 🙂 2. Said dinner is always delicious. 3. Scott and Janet are two of her favorite people on earth. This recipe has become a staple – it makes a great appetizer, starter salad, heck even a sauce for pasta! ENJOY. Serve with Morovino dry Pinot Grigio or Sangiovese. OK, it seems like it has a lot of ingredients and is complicated, but it’s not! With a little organization, this comes together in less than 10 minutes. Saute the shallots in the butter over medium heat – we want soft and golden, not brown and burned! Make a small “x” in the bottom of the tomatoes with a sharp pairing knife, then put them in rapidly boiling water for 2 minutes or until the skin starts to peel. Carefully remove the tomatoes (those are some hot tomatoes), let them cool a moment, then peel, seed and dice them. Here’s where we can get creative. If I’m using this as an appetizer, I cut the cheese log in half lengthwise – don’t worry if it crumbles a bit, the marinade covers a multitude of sins. If I’m using this as a salad course, I slice the log into 1” thick slices. Or, use one of those Tuperware mold things and form a pretty shape. Whatever shape you choose, here’s what happens next. Lay the cheese in a flat dish – I use a Pyrex 9 x 9” baking dish. Spread the shallots over the cheese. Put the diced tomatoes and the remaining ingredients in a bowl and mix. Pour the mixture over the cheese. Cover and let set 24 hours to 3 days in your fridge. Fun serving options. As an appetizer, just serve the cheese log with garlic toasts. As a salad course, place 2 leaves of butter lettuce on a plate, top it with one of the cheese rounds then spoon the extra marinade on top (OMG, this is AWESOME and really fussy looking) If the log gets to crumbly, listen to what it is telling you! Smash the cheese and marinade together, then spread on small slices of peasant bread and warm in the oven. Or this is a good time to toss the cheese and sauce with hot pasta to make a main course! *Mrs. Vino Cheat – if the Roma tomatoes don’t look good, or you don’t have the time or inclination to use fresh tomato, you can substitute 1 14.5-ounce can of diced tomato, drained and it still tastes mighty good! This is a great 10 minute main course salad for those days when you DON’T have 30 minutes to prepare a meal, but you DO have leftover steak. This is one of Mrs. Vino’s favorite uses for left over flank steak. You are currently browsing the archives for the Soups and Salads category.